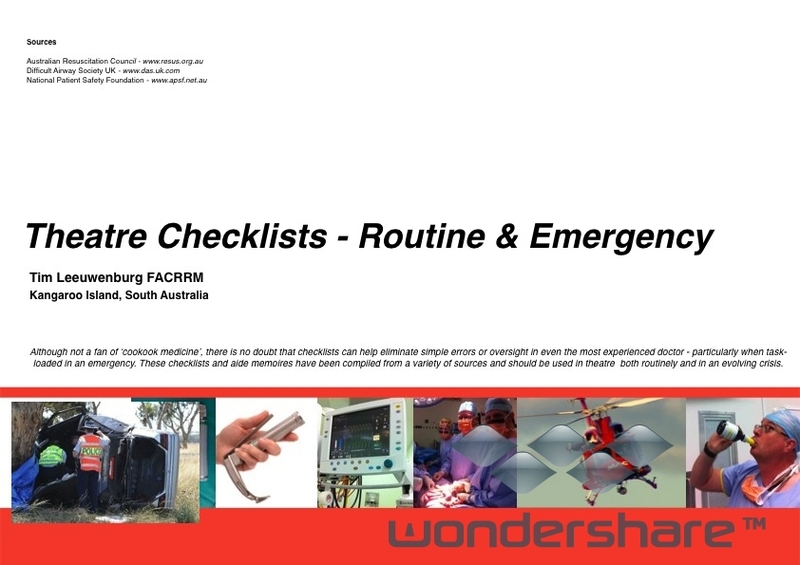 RURAL HOSPITAL THEATRE CHECKLISTS – A series of checklists for use in OT or ED for rural doctors, collated from various sources. 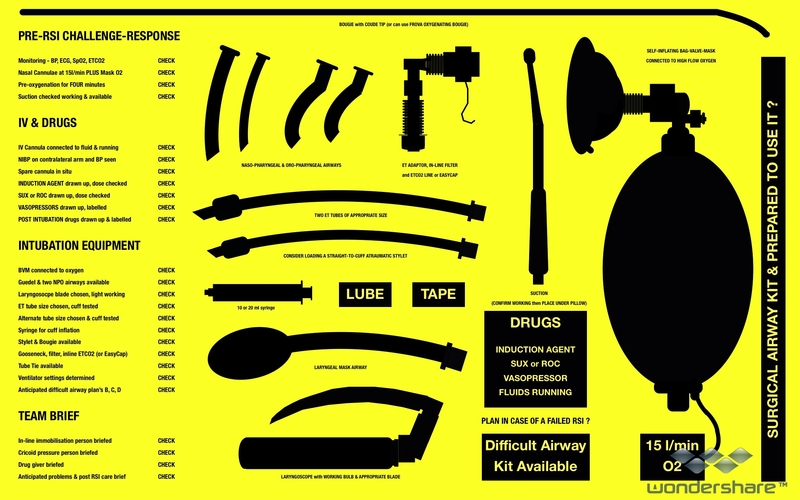 RSI KIT DUMP – Are you an occasional intubator? Or too task-loaded with a critically-unwell patient to explain RSI procedures to (occasionally inexperienced) nursing staff? Use the RSI kit dump mat to help set up and preparation. Simply download, then take to local printshop to print out as a 20×30″ PDF to laminate and store on your resus trolley. AIRWAY PLANS A-B-C-D SUMMARY KI hospital – Modified from the UK’s Difficult Airway Society guidelines, this is a local ‘difficult airway’ guide for Kangaroo Island. Feel free to plagiarise. CICV Prompt Cards and CICV Flowchart – Print these out and use to both set up kit for the dreaded “can’t intubate, can’t ventilate” crisis, as well as to facilitate training and crisis management for Theatre/ED staff. Emergency Dept cards and More ED Cards – I’ve started to use these handy cards for things we do infrequently, but which are time critical. Things like how to setup the Oxylog, draw up an adrenaline infusion, perform an RSI checklist, troubleshoot the EnFlow fluid warmer etc. My advise is to print them out, laminate them (NB: most are double-sided) and place into leaflet holders at the head of bed in your Resus Bay. Next time you are managing a critically unwell patient, it is easier to pick up a card and hand to a staff member, to help him/her setup infusions or equipment…much easier than relying on the people around you who ‘should know’ and acknowledges that when the s*** hits the fan, even the best of us need an aide memoire. I’ve used them and like ’em. They work. 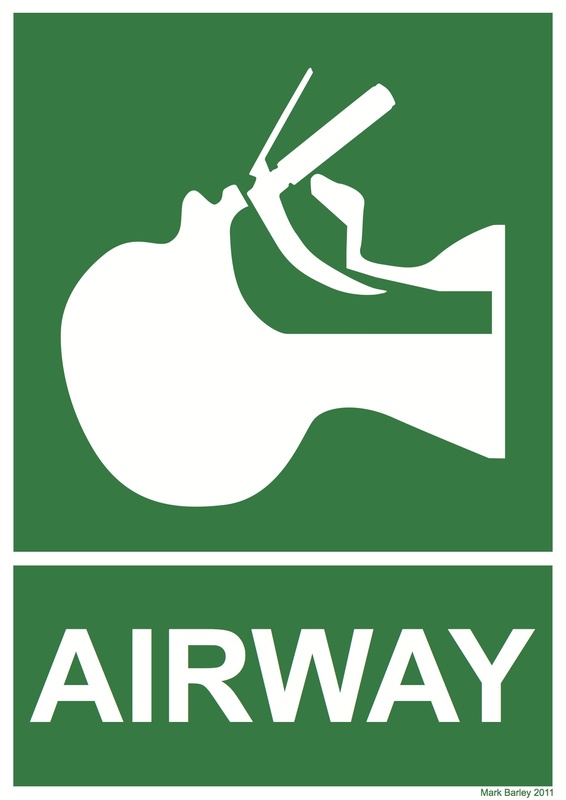 Use the above Airway Sign to mark the location of your Difficult Airway Kit in ED or Theatre. Yeah, yeah, I know everyone should know where it is – it was covered at induction. Bet they covered fire escapes too, but we label those because in a crisis people panic and forget. This way even the most freaked out clinician can find their way to difficult airway trolley or direct someone else to the relevant kit. Of course, this assumes that you have the kit! Check out my paper on rural GP-anaesthetists and difficult airway equipment and use both the ANZCA PS56 documentation and UK’s Difficult Airway Society algorithms to guide equipment choice. Moving away from airway, here are two useful guides for rural doctors in a hurry if needing to perform craniotomy – as well as getting the neurosurgeon on the blower, these two papers give step-by-step guides on performing a Burr hole. I particularly like the Canadian Rural Medicine guide which suggests “if in a hurry, skip the main text and just read the bits in bold“. The other is from a former medical school colleague, Dr Mark Wilson – now a neurosurgeon and HEMS doctor, as well as a throughly nice chap with an interesting past in austere and space medicine. There is also an eAbstract on the “airway toolkit” to be presented at SMACC2013 – it’s relevant not just for rural doctors, but also for small EDs or ICUs where immediate access to specialist anaesthetists & equipment is lacking. Other than airway, I’m also passionate about how rural doctors can help bring ‘quality care, out there‘. One of my drives is to further utilise the unique skill set of rural doctors – many have advanced skills in resuscitation and airway management – yet as private practitioners we are excluded from State disaster plans. Give the spate of bushfires, floods, cyclones as well as ever present risk of mundane motor vehicle crashes, surely we could use the skills of these doctors before retrieval services arrive? After all, there is a tyranny of distance on Australia and critical illness does not respect geography. Improving prehospital care in rural Australia – time to borrow from overseas models? Put simply, the UK has BASICS – recognising the value of getting early intervention to a crisis. Arrangements for calling rural docs are ad hoc and not standardised. Whilst some rural docs are excellent, others may not be confident in critical illness. So better to call someone who knows what they are doing, than an ‘enthusiastic amateur’. To do that, we need to either stop calling rural docs..or train them and integrate them to trauma systems of care. South Australia’s RERN is one such model. One question that commonly comes up is that of what to carry in your doctors bag. Needs will differ – for most home visits I would keep it simple – BP cuff, stethoscope, otoscope, means of accessing & recording notes and medicare forms. RURAL DOCTOR UPDATE – DOCTORS BAG from Tim Leeuwenburg on Vimeo. Below is an example of the KingVision videolaryngoscope in action. Available for around A$1000, this device makes VL an affordable addition to difficult airway kit, especially in cash-strapped small rural hospitals. I try and use it on every elective list, just to keep my hand in for when I really need it. Will VL replace DL? I doubt it. But is VL useful when DL is difficult – you betcha! Both of the above were difficult direct laryngoscopies previously. VL makes them look easy…but clearly the technique with the Bullard-type blade on the KingVision is a little different to a standard Macintosh blade, and the second video with blade-tip under the epiglottis makes the cords seem way, way too close! One of the problems of VL is that whilst you get GREAT views, passage of the ETT may not be easy – the technique is subtly different to that of direct laryngoscopy (DL) – when choosing a videolaryngoscope, if money is not an option then go for the type that allows standard DL and rapid conversion to VL techniques. The C-MAC is the best I have seen…so far. Christine, thanks for bringing this to my attention; have now updated the MH section. That MH ANZ webpage is an excellent example of taskcards and checklists for crisis management. Thanks again.